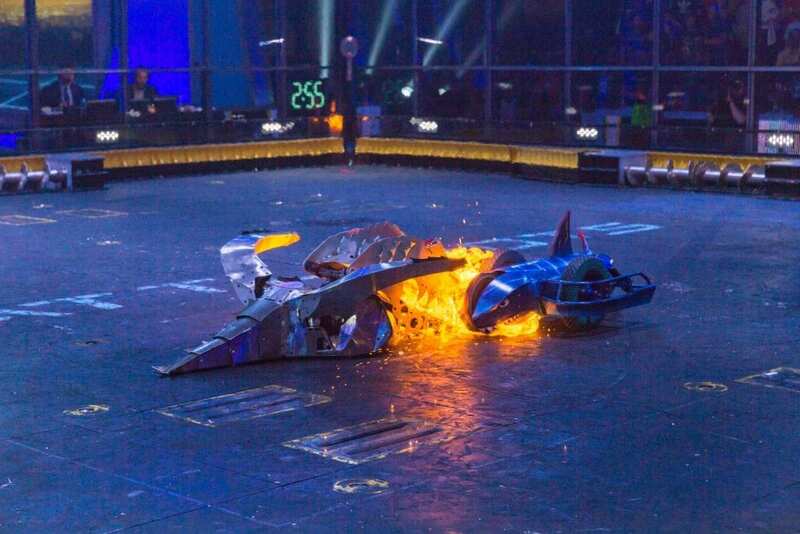 NOVO was proud to sponsor one of our senior systems engineers, John Hoffman, and his teammate, Ed Robinson, at this year’s Battlebots TV series televised on the Discovery and Science channels. John and Ed designed and built Sharkoprion, a 250-pound shark made of 85% recycled parts. Sharkoprion, based on a 290 million-year-old shark, boasts 7 propane tanks, 2 wheelbarrow tires, and 2 wheelchair motors, and beats up on its opponents with a spinning disk mounted on its snout as well as a heavy, jointed tail that can smack an opponent like its prehistoric brethren may once have done. Sharkoprion scored 3 fights as an alternate in the 2018 series. In this fight, Sharkoprion faced off against two opponents: Deviled Egg, with its 75-pound drum spinner, and Kraken, with its powerful crushing jaws. As the arena lit up and the fans cheered, announcers Chris Rose and Kenny Florian donned shark-fin headbands. Sharkoprion came out of its corner spinning to deliver a tail “hook” to Kraken. It spent some time in Kraken’s jaws, but Kraken’s tires were flattened. Then, driving its spinner under Deviled Egg, Sharkoprion flipped him like a short-order cook. Deviled Egg remained belly on the mat for the duration of the fight, futilely spinning its wheels. Kraken once again grabbed Sharkoprion in its jaws, the shark’s spinner wedged ineffectually between Kraken’s body and wheels. Kraken had already lost its fang by holding Sharkoprion’s business end in its mouth. Per regulations, Kraken had to let go after 20 seconds of hold, but by then, it was too late: Kraken’s tires were tattered and it was unable to move. Sharkoprion was the only bot left rolling when the bell rang and the ref declared a double KO. Kraken shooting flames at Sharkoprion. Warhead’s owners outfitted it with a dinosaur head for this fight and hinted that they were planning to attack Sharkoprion’s sides and tires. Warhead, a well-known bot, sports 120lbs of crushing force and 4 flame-throwers. Ed’s strategy was to out-drive Warhead. Warhead began the fight by parading around the ring, green eyes glowing and fire shooting from its mouth. It spent much of the fight trying to melt Sharkoprion’s tires. Although Sharkoprion landed several ear-ringing blows with its spinner, Warhead too often had one of Sharkoprion’s tires in its jaws. It succeeded in grabbing the tires and ripping them off, leaving Sharkoprion with limited maneuverability. Despite a valiant effort from team Sharko, Warhead won by unanimous decision. 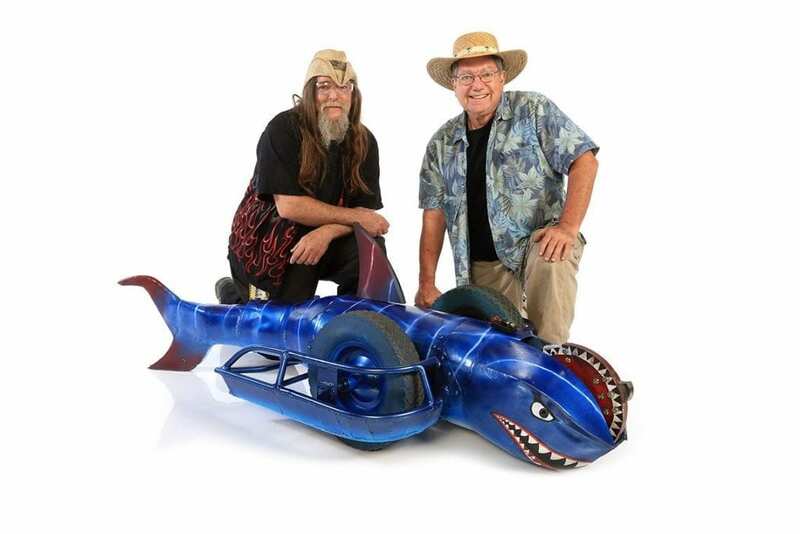 Ed Robinson, left, and John Hoffman, right, pose with their bot, Sharkoprion. Gemini is two identical bots with saws and bulldozer snouts, so part of the strategy for Sharkoprion in this fight was to bait the opponents so that they would hit each other. As the 3 bots collided in the opening seconds, sparks and metal shavings sprayed into the air. Sharkoprion’s spinning maneuvers vexed the twins, with the tail slapping the small bots squarely several times. Gemini was not effective at pushing the shark around, but it landed an early blow that tore a gash in the shark’s snout. With about a minute left in the fight, Sharkoprion succeeded in evading the bots as they approached from two different directions, resulting in a little infanticidal damage as a piece of Gemini’s housing went flying across the arena. Seconds later, Sharkoprion’s grinder took a nice chunk of metal out of one of the opponents, and one of Gemini’s tires came loose and bounced across the floor. But in a move straight out of WWF, a twin got under Sharkoprion and hoisted it into the spinning screws at the side of the arena. Sharkoprion then landed a blow that caused one of the other bots to lose a wheel, and then they both were caught by the killsaws. The judges had a split decision, but Sharkoprion was declared the winner, making Sharkoprion 2 for 3 in the Battlebots 2018 season! John would like to thank NOVO for use of equipment and the company truck. He also sends a big thanks to NOVO staff who helped out: Brandon for propane tanks, Paul and Alan for oxygen/acetylene tanks, welding equipment, and welding help, Lee for machining the weapon teeth, and Leo for welding. Thanks to Waterjet West for additional support. To see other ways our engineers spend their free time, visit our Team and Culture page.